How to make charms out of cardboard was a subject I covered a few years back when I did tutorials for a US based craft website. Back then, I was one of the makers getting paid to supply step by step guides for subscribers. Eventually, the website got bought out by someone bigger and the guides that all us makers had supplied (for very little pay!) were put onto YouTube and are still being shown on there to this day, including my original ideas for how to make charms out of cardboard. Since I first created these charms, I have seen lots of people adopting this method and it seems to be quite popular. So for those people who have not seen my original step by step tutorial on how to make charms out of cardboard, I decided to make a video showing what I did. You can see the video on my YouTube channel Rainbow Lane by clicking here. And click here to see a previous post about using scrap card to make jewelry. The original charms I made for the tutorial back in 2015 - watch the new video for an updated look at how to do this. If you have ever wondered how to make charms out of cardboard, you will love the video! Whenever I want to learn something, nothing frustrates me more than long drawn out videos that take ages to show the crucial information. I usually click off and find another video that is shorter and more to the point. So I keep this in mind when I make my videos. I try to show you what you need to know, quickly and easily as I know your time is precious. That's why my video on how to make charms out of cardboard is fairly short and as easy to follow as possible, without me actually being right there with you. I also try to help busy crafters who don't have easy access to craft shops, or have time to spend online sourcing the supplies I use in my videos, by sourcing the products and putting links to them on my Amazon Craft Supplies page. ...a jump ring really easily and neatly, like this? Don\'t worry - I put everything you need on my Amazon Craft Supplies page! But what about the images I used in How To Make Charms Out Of Cardboard? Can you get them too? Yes you can! Those images are my own designs and are available in my Etsy shop. Making these gorgeous little charms really is so easy! Whether you use my images or your own, it\'s so easy to make some really impressive little charms by using cereal box cardboard for the main material. And if you were going to throw the box away, that means your supplies for this project are partially free - right? And what could be better than craft supplies that are virtually free and at the same time, save even a teeny bit of rubbish from landfill! 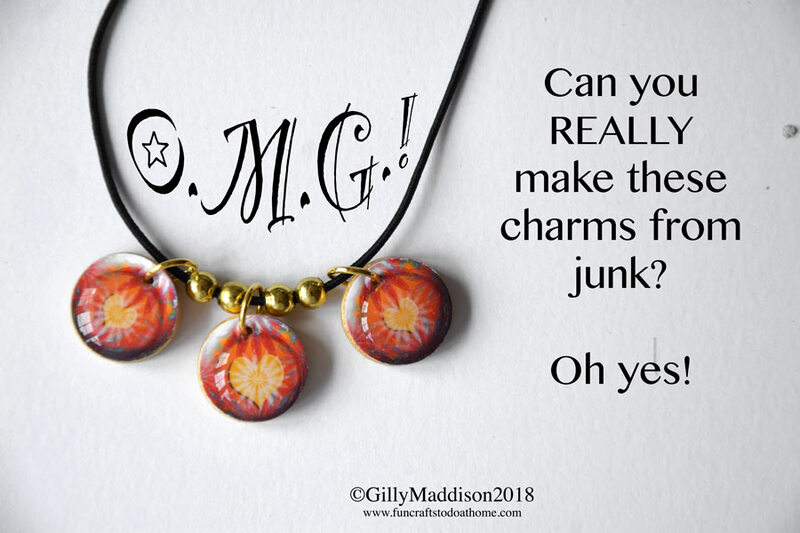 You can easily make charms just like this - from junk! So why not rescue some cereal box cardboard or card from some other packaging and have a go at this project? Let me know how you get on learning how to make charms out of cardboard and leave me a comment below the video on YouTube. Next Next post: How To Create Abstract Art VERY Easily!